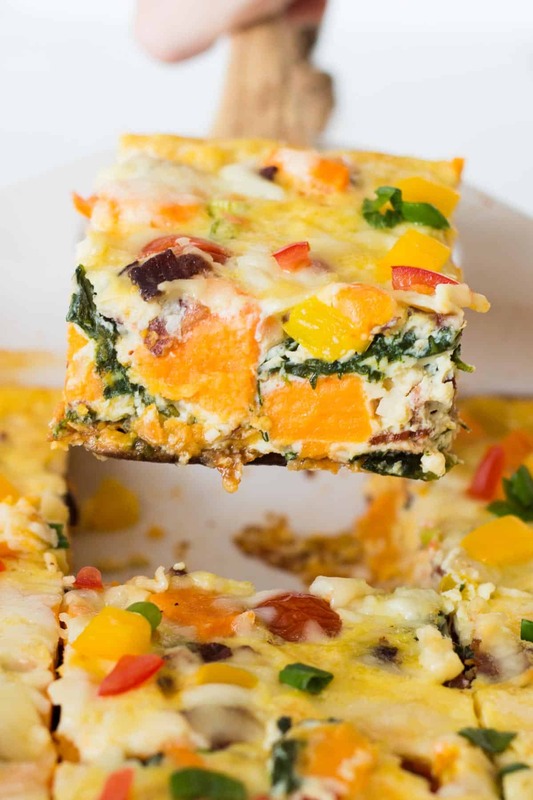 This healthy Sweet Potato Breakfast Casserole with eggs, bacon, spinach and more veggies is a perfect way to feed a crowd. The overnight option makes it especially appealing for the holidays. 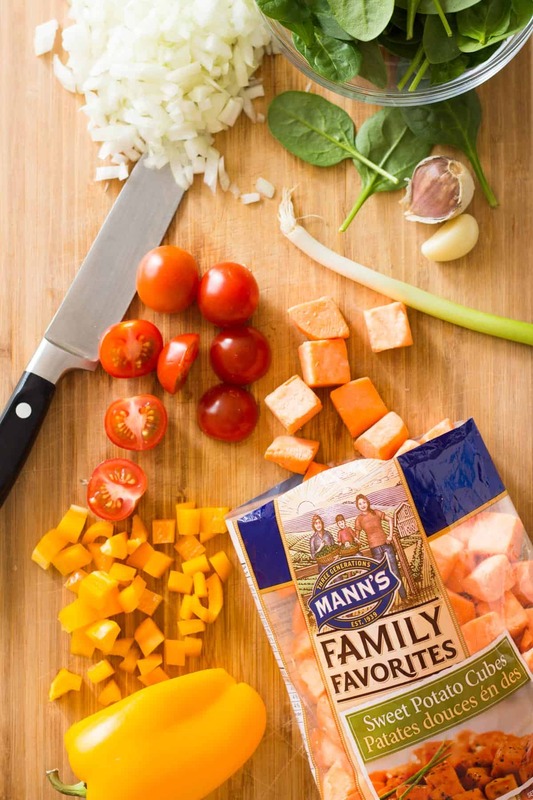 This post is sponsored by Mann’s whose ready-to-use sweet potato cubes make the prep of this dish a breeze! The holidays are a time of coming together with family and friends. And lots of good food can’t be missing in these get togethers either! 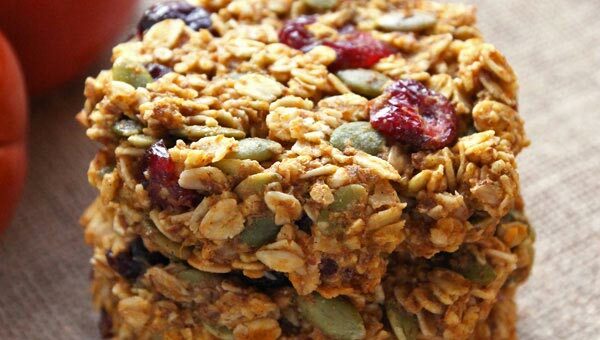 If you are having house guests this holiday season you want to be sure to have an easy make ahead breakfast recipe that you can rely on. Like this amazing sweet potato egg breakfast casserole with bacon! After first meeting my husband it took me a while to get used to his love for eggs, bacon and hashbrowns in the morning. Until then, I had often skipped breakfast altogether or had something super quick on the run. Even now that I can appreciate a bacon and egg breakfast, we still don’t have this typical American breakfast regularly. Instead it is an occasional treat and only on weekends. However, I couldn’t imagine frying up the amount of eggs, bacon and potatoes it would take to feed a crowd – especially not on a holiday morning. 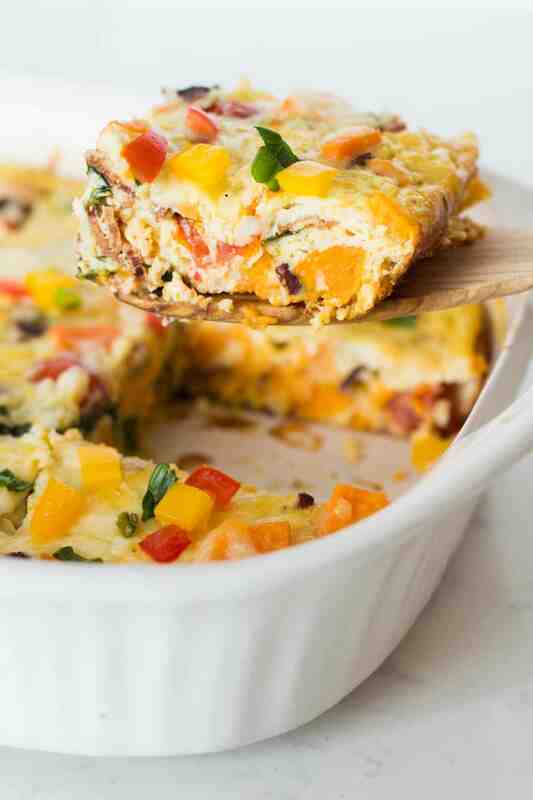 But this breakfast egg casserole is a fantastic solution and compromise. It’s got the eggs and bacon and sweet potato cubes as healthier hashbrown alternative. The egg base just offers itself to add a whole bunch of other veggies. 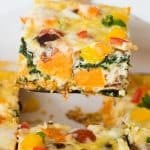 I used cherry tomatoes, bell pepper, onion, and spinach – all these make this actually quite a healthy breakfast casserole. And all these components are part of one big dish. So everyone can sit down to eat together – no need to take turns as would be the case with individually fried eggs and bacon. 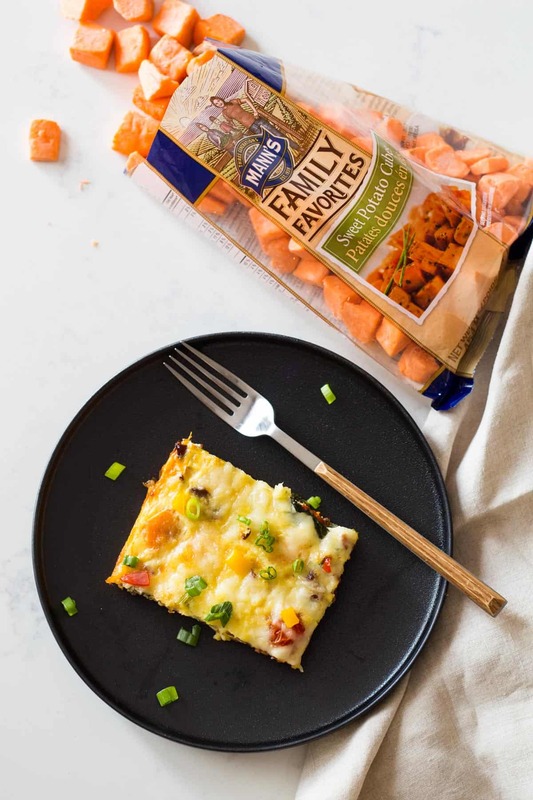 First the sweet potato cubes – you can start with those right away because Mann’s sweet potato cubes are washed, peeled, cut and ready to use right out of the bag. The convenience that all of their fresh prepared produce offers, makes it so easy to include more veggies into our meals! While the sweet potatoes are cooking, you can use that time to dice, cut, and slice any of the other ingredients. Or if you prepped ahead, you could start sautéing the onion, garlic, bell pepper and spinach in another pan. After that, all that is left to do is whisking up the egg mixture and adding all other ingredients to it. Pour into a large casserole dish, sprinkle cheese on top and bake. If you prefer not to cook first thing in the morning, especially during the holidays while you are entertaining guest, there is another option. You can do all the prep work of this breakfast egg bake – the chopping, sautéing and mixing right until pouring everything into a baking dish – the night before. After sprinkling the grated cheese on top, just cover the dish with foil and place it in the fridge for the night. In the morning just take the overnight breakfast casserole from the refrigerator and let sit on your counter while the oven is preheating. Then just continue the baking instructions from the recipe. Can you freeze a breakfast casserole? If you want to work ahead even more, you could prep and bake the sweet potato, bacon and egg casserole. Then let it cool down, wrap up and freeze the baked dish. When you are ready to eat the sweet potato egg bake, let it thaw in the fridge (overnight or may take up to 24 hours) and reheat it by baking for another 20 minutes or so. I don’t recommend freezing the uncooked spinach breakfast casserole, because the egg texture can come out funny after freezing and thawing. 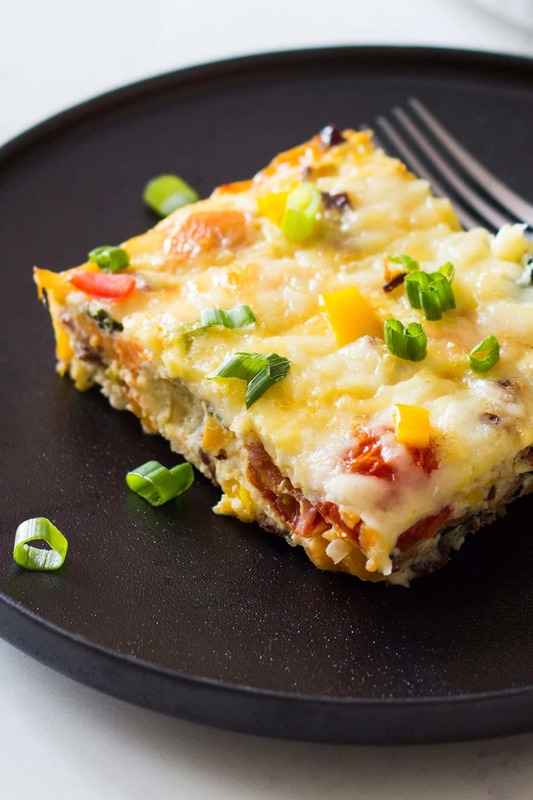 How long will a breakfast casserole keep? 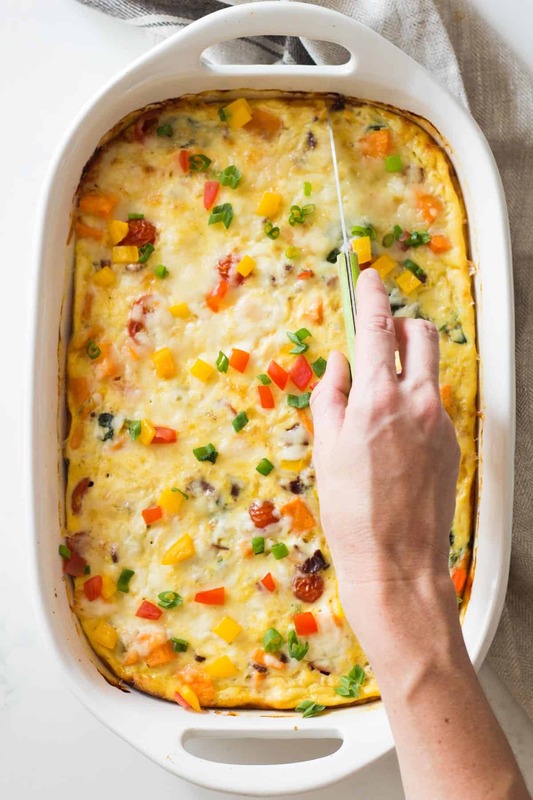 I also make this easy egg casserole (which feeds 10-12) for just my family of 3. It actually is a great meal prep recipe. 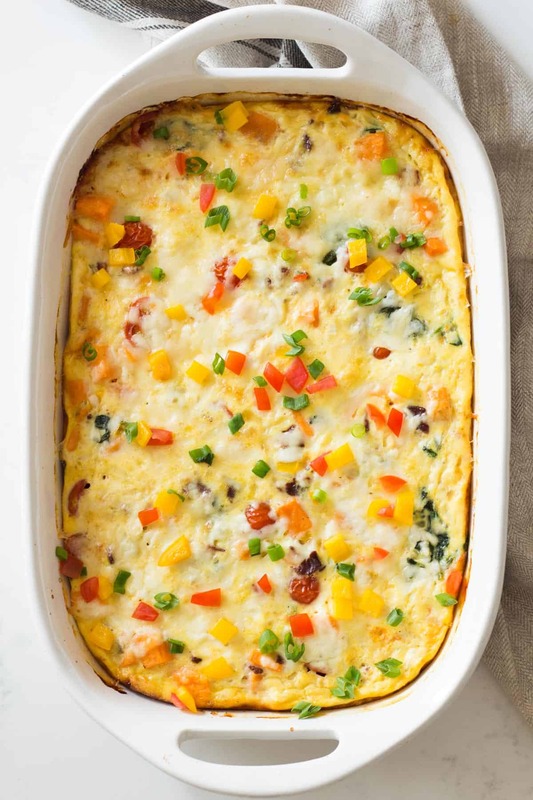 The egg casserole with bacon lasts 3-4 days in the fridge and individual servings can easily be reheated in the microwave, toaster oven, or even in a skillet. But let me warn you, when we have this sweet potato egg casserole in the fridge, breakfast isn’t the only time we eat it. We always end up eating it for dinner too. Perfect make-ahead brinner! 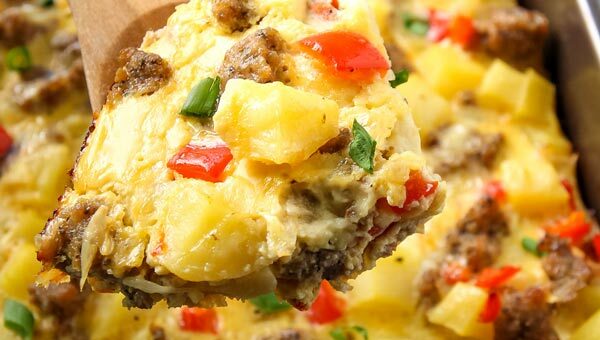 If you prefer sausage and potatoes in the morning, give this Breakfast Casserole a try. For a smaller sized sweet potato breakfast idea, try these Mini Quiches from Green Healthy Cooking. And if you prefer sweet breakfast recipes, these Gingerbread Cinnamon Rolls are a great option for the holidays too. This healthy Sweet Potato Breakfast Casserole with eggs, bacon, veggies and spinach is a perfect way to feed a crowd during the holidays. Preheat your oven to 350°F. Grease a 9x13-inch baking dish. Cook the bacon in a large pan on medium heat until crispy. Remove bacon with a slotted spoon and place on paper towel. Reserve 2 tablespoons of bacon grease. Add 1 tablespoon of the grease to the pan and add the sweet potato cubes. Cook on medium-high for a few minutes to give the cubes some colour on the outside. Then add the water and close with a lid. Turn heat to low and let the sweet potato cubes steam for about 5 minutes until semi-tender. Set aside. Add the remaining tablespoon of bacon grease to the pan (or work simultaneously in a second pan while sweet potatoes are steaming). Sauté the chopped onion until translucent. Add minced garlic and diced pepper and continue sautéing until they start to soften. Add the spinach and cook for a minute until wilted, then take the pan off the heat. In a large bowl whisk together eggs, milk, salt, pepper and cayenne. Stir in the bacon, sweet potato cubes, spinach mix, green onions, cherry tomatoes and 1 cup of grated cheese. Pour everything into the prepared baking dish and top with the remaining cheese. Cover the baking dish with aluminum and refrigerate overnight or bake right away for 20 minutes, then uncover and bake for another 15-20 minutes until the eggs are set. Let the casserole sit out for 5-10 minutes before cutting and serving. 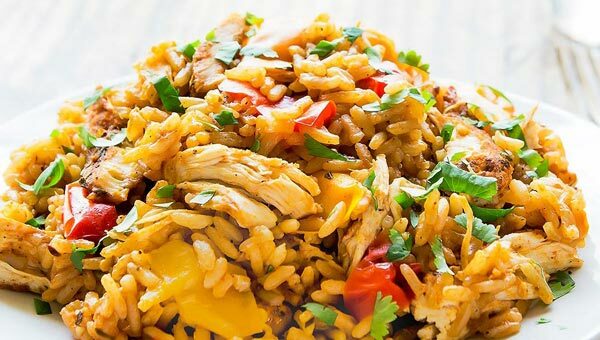 Could I make this without dairy (milk and cheese)? Would it hold the same? Made this today for Mother’s Day Brunch for 9 adults & 3 toddlers. It was delicious & everyone loved it. I’ve added it to my favourite recipes; however, I would mention that it took about 40 to 45 minutes to cook so that the eggs were set. 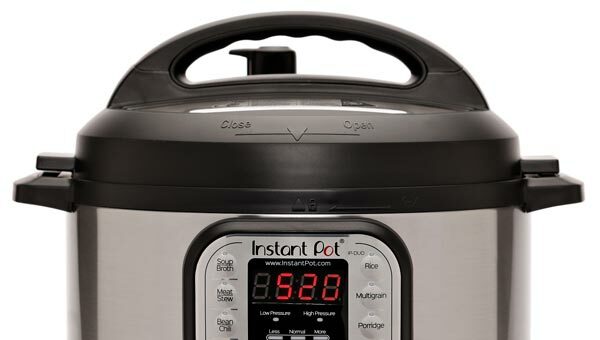 Could you make this in a large crockpot? I need to make it for a baby shower and transport it and keep it warm while there. Thanks! Maybe? I haven’t tried it but have seen crockpot casserole recipes before. Maybe wait with putting the cheese on top until the end then? Delicious! Used a fresh white sweet potato, coconut oil for the bacon grease, all else except skipped the meat, peppers, scallions and tomatoes. It actually has a sweet taste to it, plus the cayenne gives a kick yum! This looks so good! I added mushroom and asparagus cause I had a little in the fridge. Planning to throw some avacodo on top. If prepared the night before and refidgerated, how much more cooking time is needed t to start from cold instead of warm? I’d say just keep an eye on it. It’s done once the center is set. Times will vary depending on oven, type of casserole dish etc. Will it hold together without the cheese? could not find precut sweet potatoes in store so how many cups of sweet potatoes for this recipe would be helpful. This looks so delicious. I would have thought of using sweet potatoes in a savory dish, I always used them in a dessert or a casserole. Thanks Regina, I love the variation from the regular eggs, bacon beans and hash browns I usually do when family or friends stay over. It can get a bit tedious the same old British Breakfast we make, plus it’s impossible to keep everything hot if more than 6 turn up! Will try this out this weekend! Exactly! This recipe makes it possible for everyone to eat their ‘bacon & eggs’ at the same time. I’m always looking for new ways to bake with sweet potatoes, so this will totally be a new addition to our breakfast routine! I love that you can make it and freeze it, too. This looks delicious. I love sweet potatoes so putting them in an egg dish makes perfect sense to me. Oh yes, I am all for making sweet potatoes and eggs the new breakfast go-to! I would have to try that without bacon. Looks like a easy recipe. Wow! Those pre-chopped and pre-packaged sweet potatoes are great1 Your recipe sounds delicious too and I don’t know why I haven’t thought of putting sweet potatoes in a breakfast casserole before. Perfect! I am all about brunch during the holidays!